Seminars are a great way to educate the employees or the students or interested individuals on a particular aspect. It helps in bringing the expert who has the knowledge, the skill, and the experience and wants to share it with other fellow members who wish to learn something. A seminar is held by various organizations who wish to educate their employees and by various educational institutions who wish to educate their students. In order to bring more people to the seminar, invitations are to be made and distributed so that individuals can attend the seminar and educate themselves. In order to attract individuals to the seminar, the invitations should be catchy and aesthetically pleasing yet should maintain the formal decorum. They should have the proper details mentioned such as the topic of the seminar, who will be coming to the seminar, who the guest will be, the venue of the seminar, the timing of the seminar and whether or not if there is an entry fee or a ticket to be bought. The invitation can also have some pictures as well to make it more interesting and can have a map at the back in case the people have some problem reaching the venue. The invitation should always be written in a font that is formal and can be comprehended and can be understood by people. Blacks, blues, fawns and such colors should be used for a formal invitation. 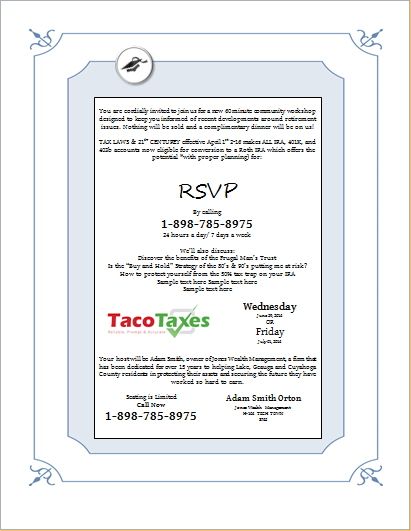 One can even make use of a Seminar invitation template to avoid the hassle of designing an invitation. Download the template to customize it completely as per your requirement.